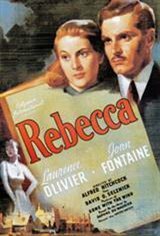 While vacationing in the Riviera the wealthy Maxim de Winter (Lawrence Olivier) meets a young and beautiful woman (Joan Fontaine), whom he instantly falls in love with. They quickly decide to get married and return to his estate. Once settled, Mrs. Winter notices that the other members of the household, particularly the housekeeper Mrs. Danvers (Judith Anderson), still hold a high regard for Maxim's deceased first wife, Rebecca. Confused and frustrated with the late Rebecca's mysterious legacy, the new Mrs. Winter is pushed beyond her limits, causing her to lose grip on her sanity. Based on the novel by Daphne Du Maurier.